GL Tron Game Review - Download and Play Free Version! Relive light cycle racing from sci-fi classic TRON! Several types of gameplay including wall acceleration which increases your speed as you get closer to opponents' walls. Challenging and fun gameplay with varying difficulty settings. Multiplayer option on the same computer only. Brings the classic movie to a playable game. Game can lock up while playing. Mouse controlled camera can be difficult to control. After some internal discussion we decided to discontinue this game due to potential trademark violations by the game developer. Game remakes, as fun as they are, actually are not legal if they use trademarked names or game features found in the original game. Since this particular game closely resembles the original, we decided to be safe rather than sorry and discontinued it. Can you steer a light cycle and finish in 1st place? 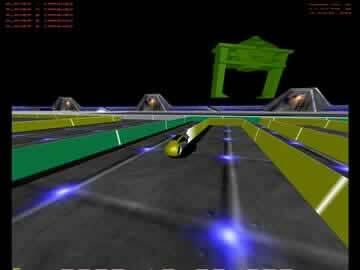 The game is fairly simple, you race your light cycle at astounding speeds and try and create an inpregnable wall for your competitors to crash into before you hit the system's wall and die yourself. How do you do this? Basically, you navigate through the system and keep close tabs on where your competition is via an overhead map. The trail you leave is made of light and acts like a wall for your competition to crash into. Make sure you miss their traps and try and set up your own for them to run into. Based on the classic movie TRON! Where did this game come from? Basically it was inspired by the cult classic TRON from the mid 80's. The developer took the premise of the movie and decided to make a game based on it. This little game is extremely addicting and the graphics are amazingly well done for a FREE game! Hop in your light cycle and let's take a spin! GL Tron brings the light cycles of the classic science fiction movie Tron to your computer in an exciting and well made game. 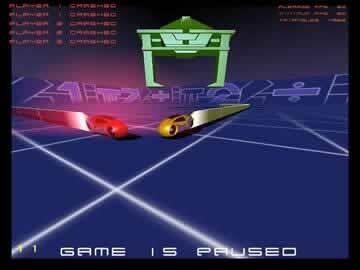 If you are unfamiliar with Tron, the premise of this game is to ride your light cycle around an arena leaving behind a wall of colored light for your opponents to smash into and the last one standing wins. GL Tron can be played solo with up to three computer opponents at once. GL Tron can also be played with a friend on the same keyboard. The game types allow for different game experiences. In Wall Acceleration Mode, your light cycle goes faster as you steer closer to opponents walls making it more challenging to avoid other walls but giving you an advantage over the other players. In Boost Mode, there was no apparent difference in play style as the assigned boost button did nothing. For difficulty settings you can adjust three things: speed of all the light cycles, how smart the computer opponents are and how big the arena is. The slowest setting, boring, is just that and on the bigger maps I would never recommend this setting as it will take so long to make any progress that you will just quickly become bored. On the the smaller maps the slow setting can be fun against the more skilled computer opponents because setting traps with your walls becomes more important. Game setup can be confusing at first because there are so many options to choose from. For beginners the defaults are set so that, other than the difficulty setting, a person who has never played any game could just hit start game and have a great time playing. Once you have figured out where all the options are and what they do you can really fine tune the game to how you like to play. The graphics and theme of this game fit well together to increase the enjoyability of the game. The graphics stay true to the movie and utilize a grid style floor with a border wall. In the options menu you can choose from three different graphic layouts to suit your liking. One drawback to this game is that there is only one song on the soundtrack. The song fits the game perfectly but after awhile you might find yourself turning off the music. The light cycles are well done and can be toned down graphically for slower systems if that is an issue. There are also several other settings that can be adjusted to reduce the strain on slower computers such as shading, filters and trails. Some of the few setbacks of this game are the camera controls. The mouse controls the orientation of the camera and if bumped, it can be difficult to get the camera back to where you like it. Also the game can freeze while playing but minimizing the window and reopening seemed to get it going again. Also there is no option for customizing the light cycle in anyway. It is possible to choose a different color by changing which player you are but nothing else can be customized. 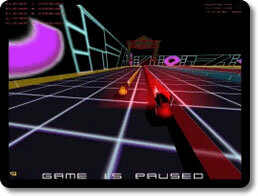 For anyone who has seen Tron and dreamed of riding the light cycles or anyone who has never even heard of Tron, this is an exciting game that can be played with friends at home or just against the computer opponents. The simplistic but detailed graphics and challenging gameplay make this a great game for anyone to play.